Nearly 60-degrees mid-February in Chicago?!? Yes. That was one week ago today. Perfect for a leisurely lunchtime joy ride with Dottie from LGRAB. This week Chicago is back to the usual frigid, snowy weather. In fact, I encountered “thundersnow” and sleet on my bike commute home last night – definitely no joy ride last night. 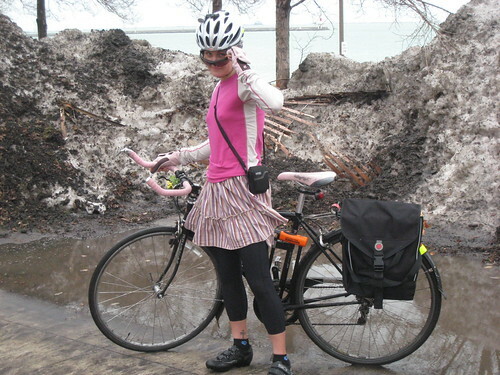 In honor of the springtime warm-up, I dressed for the occasion – wearing a skirt with bike capris layered beneath and just a long-sleeve top (and only packed the lightweight windbreaker). For the first time in months, I donned my bike shoes and clipped in for the commute. Amazing feeling and oneness with my bike again, especially to battle the headwind on the bike commute to work. And on my hands — Look ma! – exposed fingers! And then I did something I usually never do — I took a lunchtime bike ride along Chicago’s lakefront. 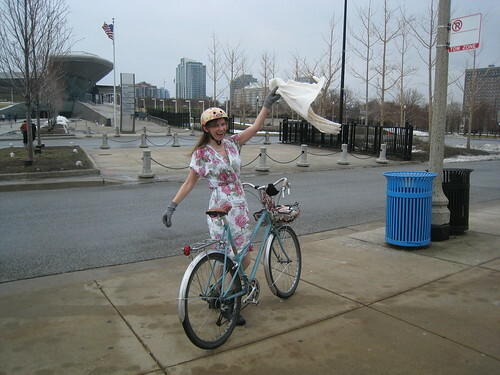 My friend Dottie from LGRAB joined me as we huffed our way into the wind toward the Museum Campus and then enjoyed the push and effortless ride back north to our respective workplace afternoon meeting appointments. Along the way we frolicked through puddles and muddy lakefront path terrain. Like giddy school girls at recess, we played and photographed our way along the lake. Neither of us wore our jacket/sweater. I even endured a bit of chill on the way back north in defiance of the cold. And Dottie had her own snag in her tights (tell-tale sign of too much fun during the work day?). Even if it only lasted one day, spring was in the air. Ah! Breathe it in and feel the vitality all around. Hopefully it keeps us all going until spring arrives for good and all that snow finally melts into a sunny summer. I love ride reports with pictures! That snow looks dirty, and it looks too cold to be dressed like that. I sure hope that snow doesn’t come back tomorrow. I change planes at O’Hare. @John – the snow was dirty! Mud-caked. Yuck. It was chilly, but definitely not too cold. It felt great — mid-50s. Only thing that would have made it better would have been some sunshine. Umm, you ladies are NUTS!!! And I take the bus when its 70 degrees outside with thunderstorms and showers. 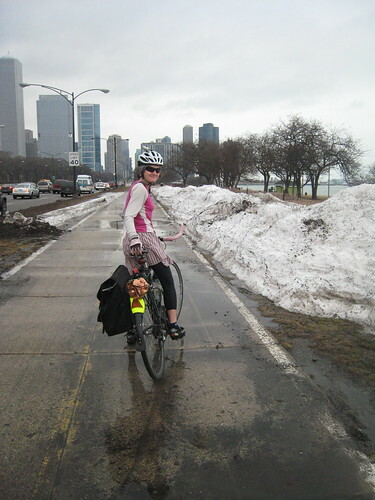 That’s like a balmy night-time shower compared to Spring Break lunch rides in Chi-town! 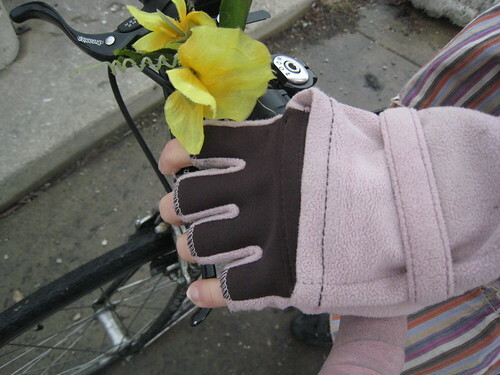 Ride on, Cycle Ladies. Those fenders work REALLY well–I’d always come home half covered in cr*p from riding the lake front during the wet times.